Christopher Razis (194 cm) inked a deal to join SC Rasta Vechta (Germany-BBL). 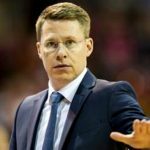 The skilled point guard joins the German team after a dismal 2016/2017 campaign. They finished second-to-last in the BBL with a horrible 2-30 showing. They will need anything they can get to recover from last season, and maybe Razis is the answer. However, the Cypriot did not play much last season. A.G.O. Rethymno Aegean (Greece-A1) was where Razis played a year ago. In 24 games with the Greek team, Razis only saw the floor for 6.0 mpg. Scoring just 1.4 ppg in this supremely limited sample size is no way to tell what he is capable of. In 2014/2015, Razis did play a significant role on his team. BiG Oettinger Rockets Gotha (Germany-Pro A) was where the point guard resided. That season, he scored 5.2 ppg in a role that allowed him to play 22.9 mpg. The guard also distributed 4.3 apg while committing 2.4 topg. This was in a lower German league than his new team, but expect similar stats from the Cypriot.